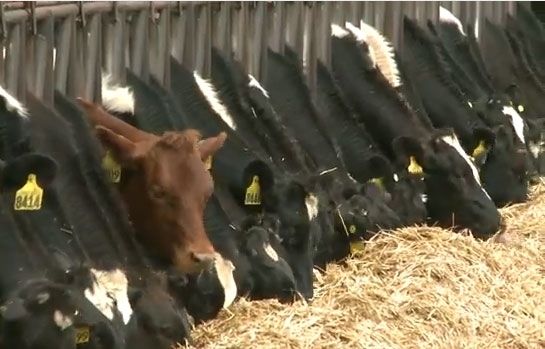 Dairy feed production is particularly amenable to conservation agricultural practices, according to four dairy operators featured in Part 4 of the Conservation Agriculture documentary series, released today on the Conservation Agriculture Systems Innovation website. (The video is also posted below.) Planting equipment for production of winter small grains like wheat and triticale and summer corn and sorghum are readily available and production processes have been widely used. In dairy feed production, conservation agriculture stands to cut tillage costs by $70 per acre, and reduce fuel use by 50 percent and dust emission by 60 percent. Giacomazzi said one of the most important things he has learned in converting from conventional farming to conservation agriculture is that it’s a whole new system and requires a whole new way to think about farming. Farmers willing to share their experiences with conservation agricultural systems will be part of the annual Twilight Conservation Agriculture field day, to be held at 4 p.m. Sept. 13 at the UC West Side Research and Extension Center, 17353 W. Oakland Ave. in Five Points. To register, go to: http://ucanr.edu/TwilightRegistration. For more information about the field day, see the field day announcement. Earlier episodes of the Conservation Agriculture Systems Innovation documentary series are available on the table of contents. To fill their need for year-round, inexpensive forages, California dairy producers typically plant and harvest a series of forage crops – small grains, corn for silage, milo and sorghum sudan. To address these issues, Jeff Mitchell, UC Cooperative Extension advisor in the UC Davis Department of Plant Sciences, was awarded a Western SARE Professional + Producer Grant for $9,400 to evaluate and refine strip-till and no-till planting systems for corn forage production and no-till drill winter forage planting at the San Joaquin Valley in terms of crop establishment, weed control and profitability (Conservation Tillage Forage Production in California‘s San Joaquin Valley, FW06-308). The work, conducted on the Larry and Daniel Soares dairy in Hanford, also sought to determine whether conservation tillage practices could enhance the quality of life of dairy producers as measured by profitability and the easing of time and labor requirements. The project team evaluated strip-till silage corn production following wheat for-age at the 600-cow dairy. In 2006, the trials evaluated conventional, no-till and strip-till in replicated strips, each 10 acres, in an 80-acre field. After the 2005-06 winter wheat forage crop was chopped in April 2006, a 6-row 30-inch Case DMI Ecolo-Till strip-tiller was used to subsoil to 12 inches and clear soil for planting. The traditional tillage strips were disked and listed before planting. In 2007, because of irrigation pump challenges, the demonstration was moved to two fields, where an 8-row 30-inch Schlagel strip-tiller was used for the strip-till comparison. The results for 2006 were compromised by irrigation challenges, but in the 2007 demonstration, corn plant populations were higher in the strip-tilled fields, and weed populations and yields were roughly equal in both fields. On the whole, said Mitchell, the results were positive and encouraging. 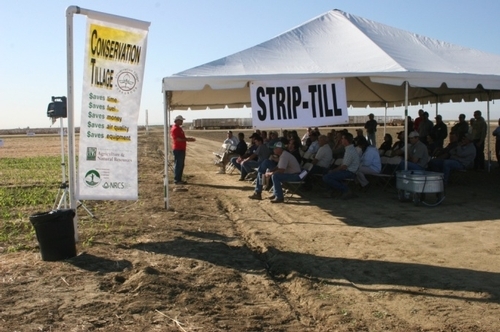 Indeed, since the project started in 2005, interest in conservation tillage has increased markedly in the San Joaquin Valley. Growers have learned that strip-tillage involves less intercrop tillage than normally employed following winter wheat chopping in preparation for spring corn silage planting. By converting to strip-tillage, a typical dairy producer could eliminate four to five tractor passes. With high fuel costs, fewer passes across the field are better not only for the field but also for the dairy producer. It has also been shown that strip-tillage and no-tillage for forage production can reduce particulate matter emissions by 50-90% compared with traditional tillage. 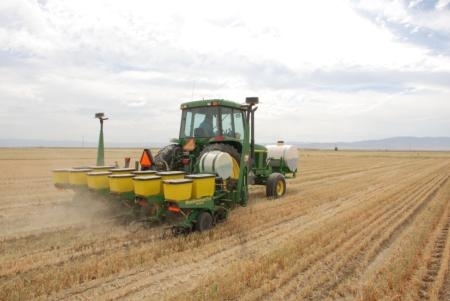 Improved strip-tilling could enable triple-cropping – the sequential growing of three crops in a year – which could help San Joaquin dairy producers manage manure nitrogen with minimal risk of losses. Mitchell is currently assessing this in a Western SARE Research and Education Grant, Triple-Cropping Dairy Forage Production Systems through Conservation Tillage in California‘s San Joaquin Valley (SW08-060). Want more information? See the related SARE grant(s) FW06-308, Conservation Tillage Forage Production in California‘s San Joaquin Valley, and SW08-060, Triple-Cropping Dairy Forage Production Systems through Conservation Tillage in California‘s San Joaquin Valley.